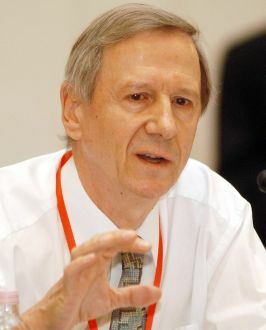 British sociologist Anthony Giddens, one of many public intellectuals throughout the world adding their perspectives to contemporary issues of the day. As some you undoubtedly have perceived by now, one of the focuses of this weblog is to underscore the need for our becoming different — to find ways to distinguish ourselves from our competitors, from other knowledge providers. The thoughts I shared yesterday regarding Extension’s transformation from technological crusader to conciliator take me back to a piece I wrote last year about our acute need to cultivate a national corps of public intellectuals. Yes, I know, it sounds a bit grandiose, but I’m more convinced than ever of this burning need. Indeed, as I see it, cultivating a committed nationwide corps of articulate, perceptive public intellectuals is a key step in our organizational transformation. It offers an immense opportunity for creative sedition — acting within our current category while playing beyond stereotype. What exactly is a public intellectual? Traditionally speaking, one who deals with ideas and knowledge within the context of public discourse, usually within a mass media context, though with the advent of the Web, this role has evolved somewhat. We need more of these people, especially within farming. The transition from the current scientific farming model to one that combines elements of the current model with sustainable practices is destined to be a difficult one. As I stressed yesterday, grassroots Extension educators have a huge role to fill helping producers undertake this transition — to put it another way, helping conciliate these somewhat conflicting visions. They inevitably will be borrowing a page or two from our horticultural educators, who are already dealing with a similar challenge helping their growers weigh and balance these issues. However, this issue is playing out within a wider public context too. Earlier this week, a New York Times digital and pop culture columnist Virginia Heffernan offered a lighthearted account of the 50-year feud between those standpat food traditionalists, commonly known as foodies, and the food techies who eagerly abandoned traditional food preparation techniques for the modern conveniences of life — can openers, microwaves and grocery store rotisseries. It’s a lighthearted treatment or a comparatively light subject, yes, but this 50-year feud closely resembles what is taking place between the proponents and detractors of the conventional scientific farming practices. It is a feud ensuing throughout wider avenues of public discourse between those who harbor misgivings about the implications of technology and those who, despite a few misgivings, are largely convinced that technology will lead us to a better ways of living and working. Issues such as these are screaming to be put into perspective. Who but Extension educators are better equipped to put these issues into context? Our history has uniquely equipped us for such a task. We have amassed an impressive record functioning as grassroots scientific vanguards, showing people how to put scientific knowledge to practical use. It’s one of the great strengths of Cooperative Extension, though, to be sure, one that has not been cultivated to its fullest potential. As our rule evolves from that of technological crusader to that of technological conciliator, the need for this corps of public intellectuals will become even more critical. To repeat my earlier suggestion, we need to start cultivating the talents of our best scientific educators. We should nurture their talents and inspire them to become public intellectuals in the fullest measure of that term — people who can identity as well as capitalize on opportunities to educate our diverse audiences about the food-and-fiber issues that lie just ahead of us. They must learn to become effective social media users, op-ed writers and trained speakers thoroughly equipped to engage clients and stakeholders in a variety of public contexts. Yes, we need to be cultivating a corps of public intellectuals and promoting them with the same zeal with which Division I universities promote their star athletes. Our organizational future will depend on them.